It’s Caturday! This means I’ll be participating in the Caturday Art Blog Hop hosted by Athena and Marie, as well as continuing Blogging From A to Z Challenge. We’re up to P so mind your P’s and Q’s. Anyone know what that means? I don’t. Anyhoo, I can promise a pawsome post. There are lots of ways I can go with this one. I’ve told you how TW keeps a record of all my litter box activities. All the pees and poos are monitored for size, texture and frequency. OK, she doesn’t really keep a written record cos that would be weird but she does have it all inside her #senile head. What keeps this kitteh well oiled and regular? 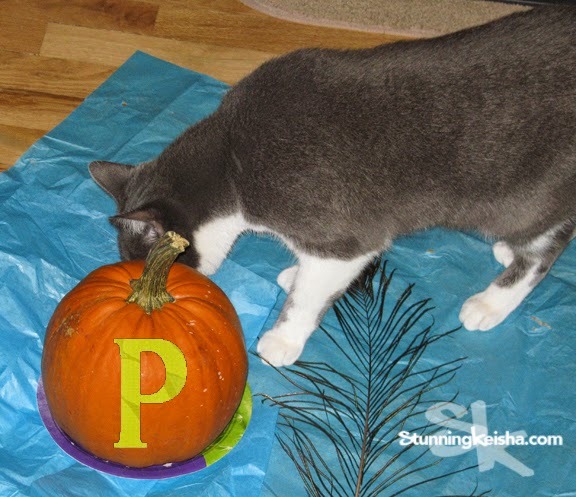 Pumpkin—today’s official P word. I eat my gut rot with pumpkin soup daily. Pumpkin is good cos it helps whether you’re, you know, constipated or your poos are runny. It’s got all kinds of fiber to both help solidify the mush and help pass the concrete. MOL! Are you enjoying this? HAH! I better get to some art before I gross everybuddy out! This art certainly won’t gross you out! I found a new filter I love called gradient paint to go along with today’s featured letter P. It only comes in one color combination but it’s stunning! 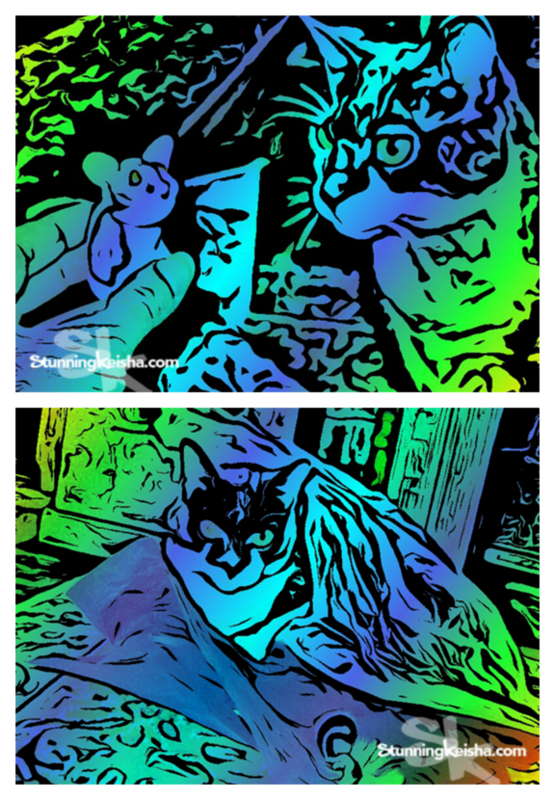 Today’s P cat is a work of art unto himself but I added an artistic frame. PAWS finally has a cat named Paws and I get to innerduce him to you! Meet Paws. He’s a very gentle, calm, shy mancat who gets along fine with other cats. He needs a quiet home so that he can adjust to all the changes in his life. Photo © M. Swanson for PAWS. The five-year-old Paws was an "owner release.” This couch potato of a cat needs you to adopt him. He’s been at PAWS since early March. Rumor has it he seems depressed and we can’t have that. As you can see, he spends most of his time in or under this cat tree house. Sigh. Are you the one who will rescue him and give him the love and home he desires? If you’d like to adopt Paws, fill in their inquiry form. 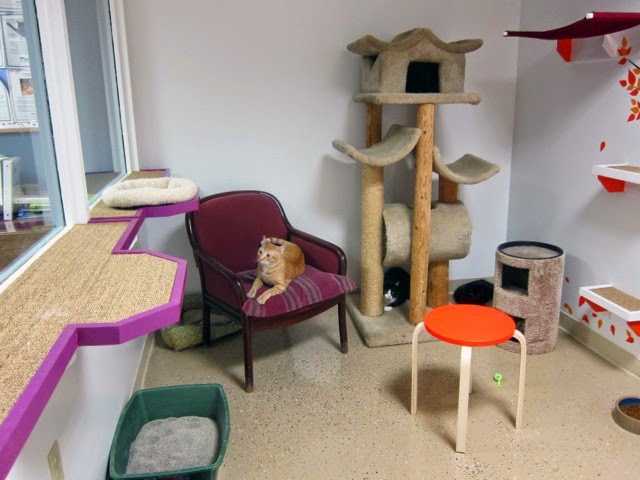 For more information about the Pet Animal Welfare Society (PAWS), and a complete listing of their available cats, go to the PAWS website. If you'd like to read more Feline Rescue stories and see more pictures of their cats, check out the Sunday at the Shelter blog! My human is inordinately fascinated with my litter box activities too! What a sweet face Paws has and we wish him the best of luck. Have a super Saturday. I love the art images. They look super stunning! Poor Paws. It's sad to read he spends most of his time in or under cat tree house. I hope he finds loving home soon. Such a letter for the day CK, P wars are back again. I'll ask the peep! I suspect she has been told to mind those things a lot. Paws is such a handsome boy... we sure hope he finds a true forever home soon. Cool art effect! Paws is so handsome -- surely he will find a forever home soon now. That is a very cool effect for your art work again this week. you seem to have a good eye for that kind of thing. M just hasn't felt like helping me with mine again. She says maybe next week. You have a lot going on today. My mom keeps track of my poos too....seriously, a calendar of my goings ons (or outs) so she knows whether or not to adjust how much laxative I get. I do appreciate her diligence because stuck poos are no fun. Love your art. The blues and greens are lovely colors. Paws has a cute nose! I hope he finds his new forever home soon. oh precious sweet scared Paws. He is nervous and doesn't know why his people didn't want him anymore. Will go to the site and share him. My mum monitors all my poops too, and she does write it down. She also writes down every single thing I eat then goes tittle tattling to the vet once a week. Paws has a sweet face. It is sad that he is getting depressed. I hope he quickly gets his home. MY mommy counts and looks at all my productions and rings alarm bells of she doesn't like what she sees. Paws looks precious and nothing makes my mom sadder than a kitty who is unhappy and depressed. My Mom is too interested in my litterbox habits too! We think it's high time that PAWS had a Paws (MOL!) and wish him a forever home VERY soon! The mom is always checking the box after we go too. What's up with that?? 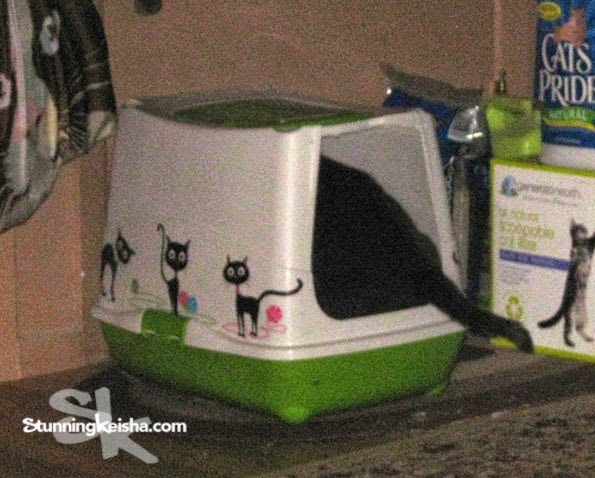 Nice litter box CK MOL! And I do love that filter! It looks amazing! That is stunning art :) I am so happy to see you are continuuing with the a-z challenge. Oh CK, I can relate to you as my Human keeps a close eye with surveillance too! 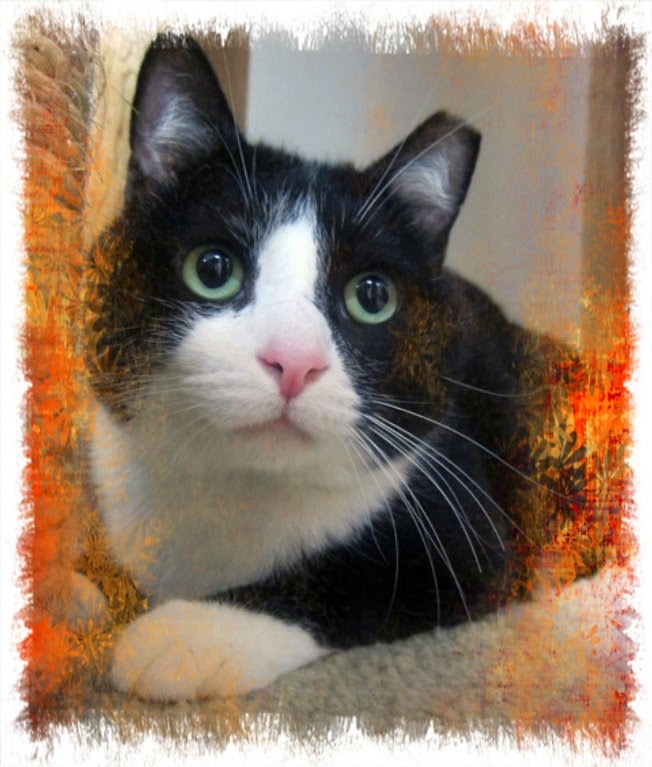 Love your art photo and we are purring for Paws to find a wonderful forever home. Hi CK......potty patrol - my Mom does that too.....oh well she says it's important that I "do my doody" (duty?). Since I take my medication in sweet potato baby food, I'm getting lots of fiber too - like pumpkin - so things are "MOVING RIGHT ALONG".....too bad our humans feel the need to monitor that! Poor guy - he could be Harry's cousin. I'm glad everything is erm, running well for you CK. CK, I think the humans have a very unhealthy interest in our bathroom habits! !